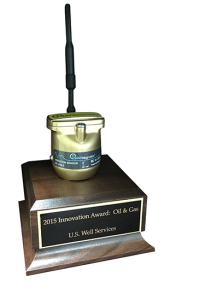 Houston, TX (2016) — U.S. Well Services was recently presented KCF Technologies’ SmartDiagnostics® 2015 Innovator of the Year Award after achieving extraordinary improvements in maintenance and uptime. USWS was selected for this award from a field of more than one hundred companies in over a dozen industries across North America. USWS leads the way among completion companies adopting wireless vibration monitoring predictive maintenance technology. After only seven months of use, US Well Services has successfully deployed wireless vibration monitoring across all of its fleets and set new performance records for its industry. The result? Within six months, USWS has significantly increased pumping time and safe stages completed per day while reducing non-productive time to a record-setting nineteen minutes per day. In a troubling market with low oil and gas prices, many competitors are cannibalizing their fleets and cutting back on repair and maintenance programs which results in unreliable equipment. However, USWS has implemented a continuous improvement process and is poised to deliver E&P customers the safest, fastest technology-enabled well completions the industry has seen.